Is buying roti maker worth it? Is roti from roti maker good? Is roti maker a good investment? We decided to answer all these questions also create a step by step tutorial on how to use a roti maker to make delicious, soft fulka rotis. Any good roti maker is capable of making good rotis. The problem is that making rotis in a roti maker is different that tava. And it this difference that causes lot of headaches. Dough is the first thing that you need to make rotis. Important thing to note is that dough for roti maker is different from dough used on tava. The dough used in roti maker has to be much softer that usual. This helps the roti stay intact and soft. Also, you should not use stored atta for using in roti maker. If you do, your rotis will come out hard with a weird texture. Another important thing to remember is that you need to rest your dough for 30-60 minutes before you start making your rotis. If you use the dough immediately your rotis will start breaking. To paraphrase, these are the important things to keep in mind when making the dough for roti maker. After making the atta, let it rest for 30-60 minutes before using. Next comes the preparation for making rotis. For this you need to do 2 things. To start making the rotis, start by making the atta balls as you would make for regular rotis. 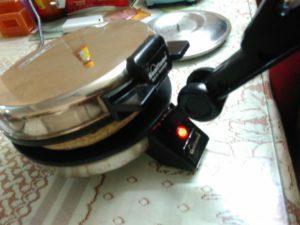 After you have made the balls, turn on the roti maker by plugging in the wall. Let it heat for 5-6 minutes until the heating light switches off. Once the light swtiches off, that means the roti maker is fully hot. Take the atta ball, cover it a little in dry atta and place it in the upper corner of the roti maker. After this, close the lid with the handle and press firmly for 1-2 seconds. It is important that you do not press for longer than 1-2 seconds. Open the lid and you will the roti is now rounded. Let the roti cook from this side for 15-20 seconds. After this, turn the roti around and let the other side cook for 15-20 seconds. You should see bubbles start forming in the roti. Depending on how cooked you like your rotis, turn the roti every 15-20 seconds so it is almost cooked. This step will totally depend on your preferences. 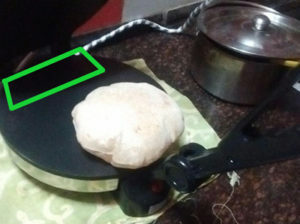 Once both surfaces are almost cooked (browning happens) and you can see bubbles appear, you can close the top lid and roti will cook automatically and slide out. Once rotis are made, cover them immediately with foil or in a hot pot. This is important as roti maker rotis will harden if they get cold. Let us paraphrase the above steps. Make the atta balls and cover them in dry atta. 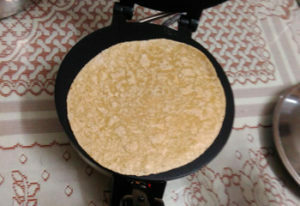 Once rotis are made, store in foil or hotpot or consume immidiately. If not done, the rotis will harden. We hope we gave you ample information about how to cook delicious rotis with a roti maker. Just follow the above steps and you will get soft rising rotis everytime. Be sure to check out our best roti maker review and things to remember when purchasing roti maker if you haven’t already. Happy roti making.